As I tap this slowly out on my phone you are snoozing on my chest. It’s been a while since we’ve done this. It’s been ten weeks and four and a half days since you moved into this world. It blows my mind to think of you inside my belly, mere inches from where you lay now. You’re really your own being now. I’m no longer two people at once. I’m back to being just me, but I’m not sure you know this yet. I often think you look at other people more than you look at me because I’m not a new person, I’m still just an extension of you, and you me. You’ll realize it soon enough. I know my Mom would tell me to cherish these moments. As we lay here, I again mourned the loss of the moment when you would have been placed, naked and slimy, on my chest having just been born. Oh how I wanted that moment. I tried to control so many aspects of your birth, just to ensure we’d have that moment in time. I wonder if I was scared we wouldn’t bond without that moment. Through all my learning about birth, in nursing school and beyond, so much importance was placed on that moment. Sure, it would have been nice, but we’ll be okay without it. I don’t know the circumstances of Linde’s birth, but being a mom of just one who also didn’t get to have that experience, I can assure you that yes, you WILL be just fine without it! BTW, did you know there is a Linde Lake right by your Uncle Andy’s cabin? I saw it on a map just today. Enjoy your time now Anna, it is the best thing ever. Thanks Lisa! I knew there was a Linde Lake, but didn’t know it was so close to Andy’s cabin. It is a pretty common Swedish last name. If you are interested, I did write about Linde’s birth here – https://lindeselephants.com/2013/06/26/linde-jane-your-birth-story/ -. 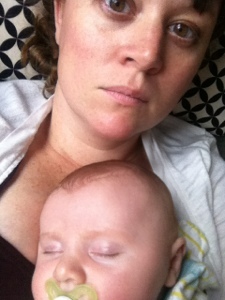 I have been trying desperately to enjoy this time, only one month of maternity leave left!